Invasive rhododendron bushes have taken over the moorland surrounding Walshaw Dean Reservoirs near Hebden Bridge and next week Yorkshire Water will start to remove it. This is part of a £2 million programme to improve the condition of Sites of Special Scientific Interest (SSSI). Over the next four years Yorkshire Water will improve the moorland after centuries of environmental change degraded habitats in the area. Most of the area is owned by Yorkshire Water and is designated as SSSI. 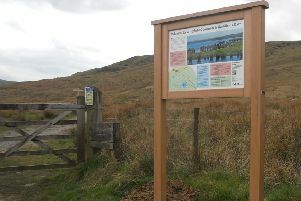 The hope is that by restoring and protecting the local landscape it will benefit the thousands of visitors who enjoy the moors and also improve the quality of raw water in several moorland catchments. Michael Toy, Yorkshire Water’s Project Manager said: “Over the next few weeks we are working with our tenants and neighbouring land owners to remove these plants which aren’t native species from the moorland around Walshaw Dean middle reservoir. Other improvements that will be made over the next four years include restoring water tables, planting mosses, native grasses and heathers, controlling rhododendron plants and bracken and repairing and removing fences. New survey techniques will be used, such as unmanned aircraft mapping to help identify areas of improvement. The project at Walshaw Dean will be complete before Christmas with the whole programme of work complete by the end of 2020.